This photo appears on Maurice’s post that describes the situation that Norman Scarth finds himself in: 6 months solitary confinement for having audio recorded a court hearing.The punishment certainly does not fit the crime. Patrick Cullinane was given four months for the same ‘crime’. A first open letter has come out and a complaint that has been ignored and a demo is being organised for this Saturday, 10am, outside Leeds prison. You can use Email a Prisoner mentioning Norman’s prisoner number A1903CF. You can phone the Governor of the Prison Rob Kellett on 0113 203 2600. There will be peaceful and lawful demonstration and rally in support of decorated World War II veteran, 85 year old Norman Scarth. Norman was imprisoned for six months on July 25th 2011 for making a recording of a court hearing. Norman’s barrister apologised on Norman’s behalf when Norman returned to court, but he was sentenced to an excessive six months in a prison for serious offenders, regardless. Since then, he was only allowed one phone call, and is being denied all visitors; his conditions could be described as torturous as he been denied exercise. He has been told that either he walks for a full hour or not at all. He is unable to walk for a full hour – he is an 85 year old man with health problems. He is cold at night and sleeps in his clothing. We feel the sentence is excessive, cruel, and inhumane for an 86 year old man with health problems, who has been fighting for our freedom, not only during World War II, when his heroic acts helped keep Britain free, but on a regular daily basis for many, many years, with his efforts to bring truth, justice, and transparency into the UK Courts and legal system and to highlight the corruption. It is a serious human rights issue. Leeds Prison is a prison for serious offenders. Whereas, once, the demographics of this prison were predominantly that of serious offenders in their 30s, the population is now dominated by senior citizens. Who is sending them there? Norman has been fighting for our freedom and now we have to fight for his! It is imperative that there is a massive turn out. Please bring placards to support the release of Norman Scarth, and video cameras if possible. Any surplus will be given to Norman for his comfort fund while in prison, or whatever he may need. He has to pay for every phone call and many other things. Please help Norman in any way that you can. Donations can also be mailed to Paul Talbot at 43 main Street, Greetham, Oakham, Rutland, LE15 7NJ. Norman Scarth fighting for Liberty & Freedom!! 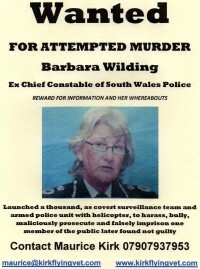 This entry was posted in Access to Justice, Article 13: effective remedy before national authorities, Article 6: fair trial, Campaigning, Fair Trial and tagged Citizenship, Finance, Leeds, Member of parliament, Open letter, Political prisoner, Prison, Prisoner (TV series), Solitary confinement, South Wales Police, World War II. Bookmark the permalink. Whilst I cannot see any way in which I can be there to support the demo I wish it every success. May I suggest that the demo itself also addresses the reason for Normans conviction and demand the freedom to record in any Court room. This is the only way that we can break the stranglehold on the Law held by Judges who at present are able to manipulste the laws to suit themselves. WE MUST DEMAND FREE ACCESS TO COURTS AND TO RECORD PROCEEDINGS. Pingback: Famous by draconian sentence and imprisonment conditions: Norman Scarth enters the blogosphere « Victims Unite! Pingback: Background facts about Norman Scarth’s imprisonment – for demo this Saturday outside Leeds Prison « Victims Unite! Pingback: Norman Scarth asks HM The Queen to prove the meaning of her Coronation Oath « Victims Unite! Pingback: What’s the point complaining? Norman Scarth hits more than four prison walls « Victims Unite! Pingback: Are there human rights for Prisoners in the UK??? « Victims Unite! Hello. I have come across your website as I have just heard a radio play by barrister Olly Jarvis and did a search on him. I am the daughter of former GP Clifford AYLING who was imprisoned for 4 years in 2000 for alleged indecent assault on patients. During the criminal trial a woman was found recording the hearings. She was asked to leave. Nothing happened to her and she turned out to be the mother of a woman who then made a civil claim against Clifford AYLING, although she was not part of the criminal trial, through the solicitor Sarah HARMAN who mounted a group case against him. Sarah HARMAN was instrumental in preventing material I wished to give to the subsequent inquiry that was set up being seen or taken into account, and the said material was returned to me. 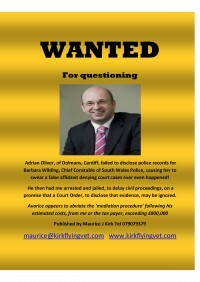 Clifford AYLING has made repeated FOI and DPA requests to obtain information that was allegedly given to the Inquiry about him – he himself was prevented from attending the inquiry despite going to court for judicial review proceedings. The criminal trial transcript from 2000 refers to the fact that a person was tape recording. We know who was involved through a person who was present at the Court. The judge mentioned that the person involved was not connected in any way to the Defendant. I would imagine that if they had been, a big thing would have been made of it and the person involved would not have got off lightly…For my part, through my father’s case, I have lost all faith in the British Justice System. At the civil hearings, Sarah HARMAN tried to get us (my sisters and I + other supporters) moved to the upper gallery (where we would have seen and probably heard very little) because media were in the public benches. Luckily for us, the court usher was sympathetic, put our case to the judge who had not yet entered the courtroom, and we were allowed to sit where the jury normally sits.